A prominent Russian federal judge, who presided over the trial in several high profile cases including the one involving nationalist organisations and another relating to corruption among top government officials, was gunned down at the entrance to his apartment complex in Moscow on Monday. According to court officials, Edward Chuvashov, 47, was shot dead by an unknown assailant who fled the scene after committing the crime, RTTNews informs. A criminal case into murder and illegal possession of firearms has been opened. The Russian Investigative Committee said the incident was thought to be linked to the judge's professional activities, although a motive for the crime had not been established. Experts were working at the scene and the gunman was being sought based on an eyewitness description. "We are looking for a man of Slavic appearance, 175-180 cm tall, 25-30 years old, average build, wearing a black cap, a black jacket and blue jeans," a law-enforcement source told RIA Novosti. The Moscow City Court's website states that Chuvashov was on Monday meant to be looking into the case of Vladimir Belashev, a former member of the Interior Ministry department in charge of fighting organized crime, who was accused of taking part in the bombings of two statues near Moscow. 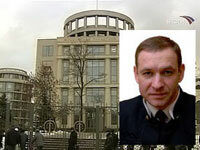 Belashev was arrested in April 1998 and was sentenced to 11 years imprisonment for terrorism offenses. In 2008, an EU court in Strasbourg ordered Russia pay 10,000 euros ($13,612) in compensation to Belashev after he complained that he had spent five years awaiting sentencing, RIA Novosti reported.